Your eyelids are drooping down irresistibly as fatigue finally takes over, after the day’s events and the last thing you see as you close your eyes is the blue-green tinge of the ocean illuminated by soft lights. Is that a hammerhead or a stingray passing overhead, you wonder and roll over onto your side, gently snoring. 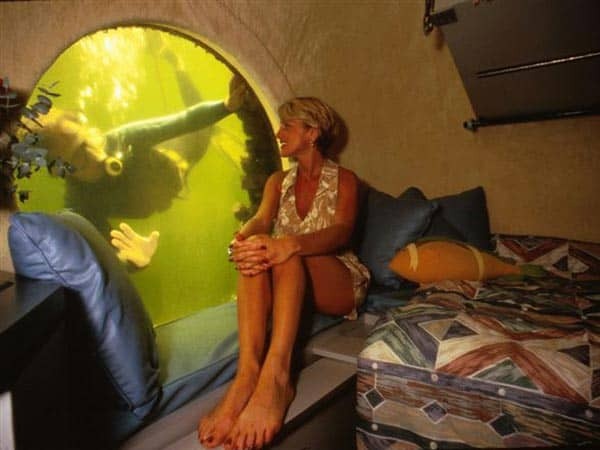 Originally a research station whose role was that of a ‘mobile undersea habitat’, in Key Largo, Florida, it was converted to a hotel in 1986. Jules Undersea lodge is so named after the famous novelist Jules Verne, author of 20,000 Leagues Under The Sea. 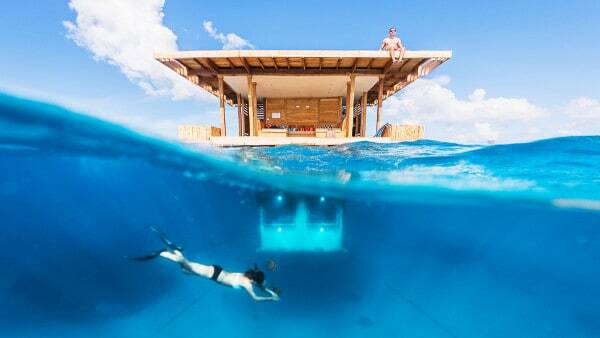 It has the distinction of being the world’s first underwater hotel. It has emerged as a destination for proposals and marriages becoming a happy haunt of lovers and couples alike. Though not 20,000 leagues under the sea, still diving is the way to reach it as the entrance is located 20 feet below the sea. Only people with a scuba diving certificate are allowed. Not certified divers can go through a 3 hour quick training in scuba diving before attempting the underwater sojourn. This hotel has entertained the likes of Steve Tyler of Aerosmith and the Canadian Prime Minister, Pierre Trudeau. The rates range from $300 per person for a group of 5-6 people to $675 per person for singles. To be part of the Mile high Club though esteemed, is now a thing of common-place. The Mile Low Club offered by Oliver’s Travels is the new thing in town! A modified luxury submarine that, unlike the other hotels in this list which are fixed at their positions, is capable of taking you to the underwater locations of your choice. Its service started in time for Valentine’s Day 2014, as an outlet for adventurous couples to get their thrills beneath the waves while lying comfortably in the warmth of their sheets. A typical stay at Lover Deep for a couple per night is priced at a little over 2,50,000 US Dollars. A unique dining experience out in the middle of the Indian ocean, that is set in the pristine waters of the Maldives, one gets to experience an incredible view. Prepared to shield your eyes as the light from the waters above gets very brilliant when the sun passes overhead. Guests are advised to wear sunglasses as they sit for lunch. The restaurant boasts a mouth watering European contemporary cuisine with an Asian touch. Lunch is priced at US $195 including a glass of champagne while dinner costs US $320 per person. The restaurant opened in 2005 and has an estimated life span of 20 years. So if visiting this restaurant has made it in your bucket list, remember you’ve got time till 2025 to do it. 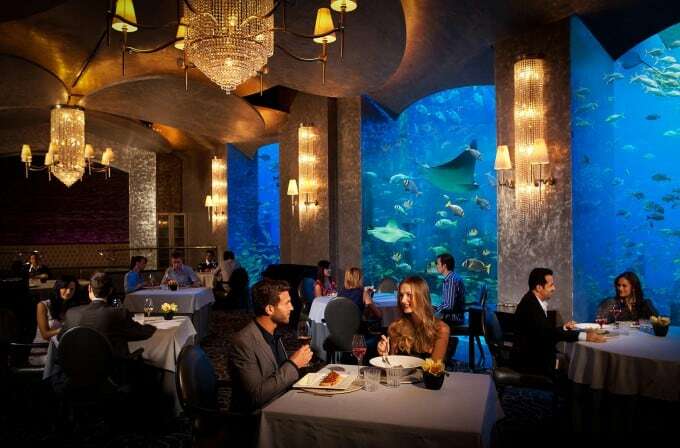 Dine and wine in style at Atlantis, The Palm’s underwater suites. Located on The Palm Jumeirah Island in Dubai, The Hotel has a private beach and offers a stunning view of the Arabian Sea. The guests are treated to an out of world experience at the underwater suites with up close views of sharks, stingrays and other exotic sea creatures. Also each suite has an excellent 24*7 private butler service who could grant your requests like the famed djinns of Arabia, be it even skydiving while dressed up as santa claus and delivering a present to your near one. The starting price of a nights stay is just a little under $8200. 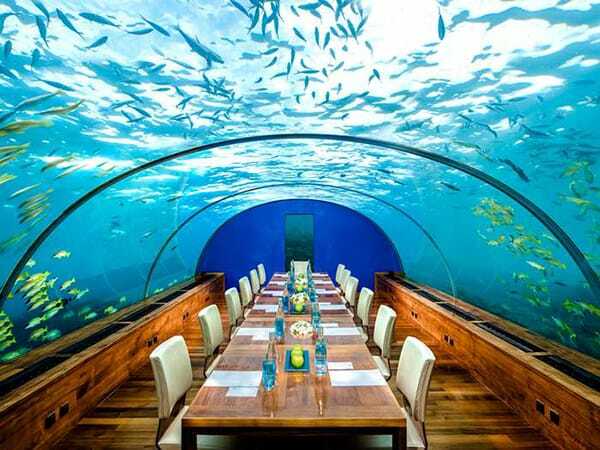 India’s First Underwater Restaurant, The Real Poseidon, Opened to a great public reception on Feb 1st, 2016. 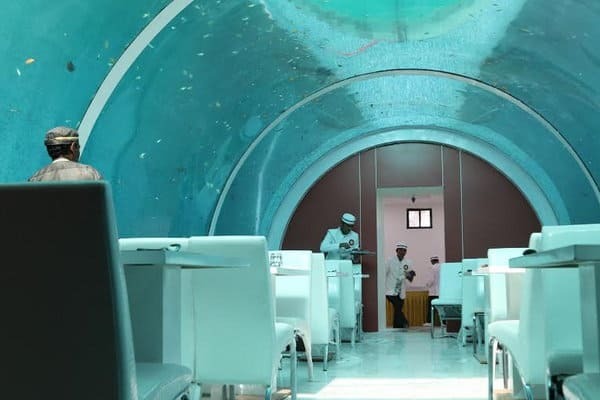 Being the first of it’s kind in India, it boasted 4,000 fish and marine species in a 1,50,000 litre aquarium and a 32 seater dining hall, serving Punjabi, Thai, Chinese and Mexican cuisines. It’s owner Mr Bharat Bhatt, who manages an engineering firm and is also into construction, designed the restaurant himself. He says the idea for such a venture came to him from his 12 year old son. The restaurant is currently closed to the public, pending few permission issues from government departments. Though not as luxurious as the other hotels in this list or having any stars to complement itself with, this hotel has a charm that is quite distinct from the rest. 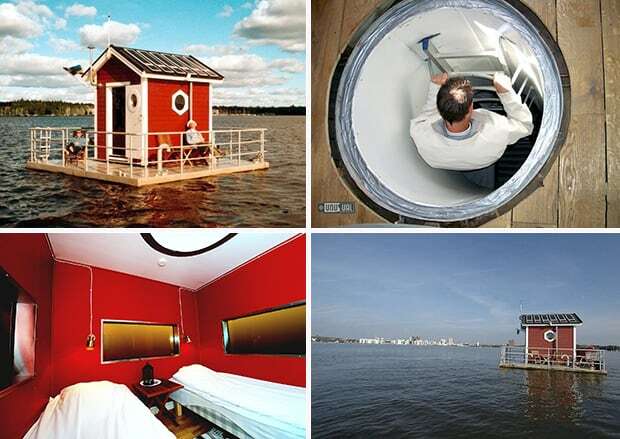 Created by Mikael Genberg as an art project, the hotel is designed like the typical Swedish red house, submerged 3m under Lake Mälaren in Västerås. The guests are taken a kilometer from the shore to where the hotel is and are then left alone for their stay. There are no amenities, one might have to fend for themselves by cooking food from the kitchen. So it’s not for the weak of heart. In the deluxe version of the stay, dinner is delivered to the guests by boat. There is an inflatable canoe present, which can be used to row to the nearby islands, if you are in the mood for some adventure. If a quiet relaxing stay is what you prefer, you can head upstairs for some sunbathing or watching the fishes from below. The base price for a night is $165. Created by the same man who was responsible for Utter Inn (Otter Inn) in Sweden, this amazing structure,another floating hotel room is the place for you to relax and get back together with nature. As a rule, all electronics are to be left behind when entering this pristine world. The reef surrounding the hotel, hidden in the light blue waters can be accessed through simple free diving or with snorkeling gear provided. At night, guests are given a visual treat by way of the tropical sea creatures which are attracted to the light outside the window. Rates are $1,500 for couples and $900 for 1 person. 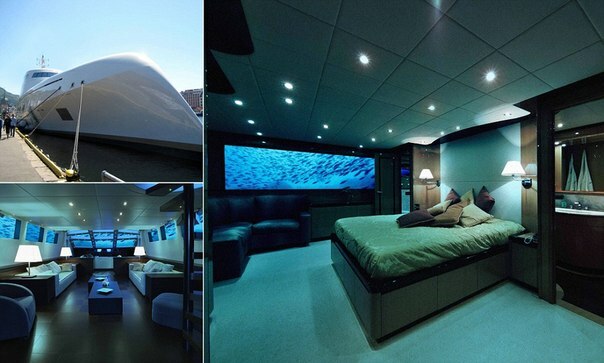 The thrill of staying alone in an underwater room, in the middle of the sea does sound exciting doesn’t it?